The teacher had barricaded himself in a classroom and fired what police said might have been a warning shot as the principal tried to unlock the door. ATLANTA – A social studies teacher barricaded himself inside a classroom at a Georgia high school on Wednesday and fired a handgun once in what may have been a warning shot, authorities said. No students were in the classroom at the time, and the only injury reported was a student who hurt her ankle running when Dalton High School was evacuated. The teacher, Jesse Randal Davidson, was taken into custody without incident after a 30- to 45-minute standoff with officers, Dalton police spokesman Bruce Frazier said. Davidson, 53, serves as the play-by-play announcer for the high school’s football team, police said in a tweet. Police didn’t immediately say why Davidson fired the gun, but noted that he aimed away from anyone into an exterior window as the principal tried to unlock the classroom door. After the gunshot, the school was immediately placed on lockdown. “I don’t know whether he was just firing the gun off to let people know to back off or what,” Frazier said. It’s not clear what charges Davidson will face. Student Emma Jacobs texted her mother while she hid inside a darkened classroom, her mother, Annmarie Jacobs, told the Associated Press. Emma, a junior, said in texts that her teacher had turned the lights off and told the students to sit in a corner. Jacobs said she was driving in Tennessee, about 100 miles away from the school, when she got the texts. She said she immediately pulled over and started shaking. The shooting happened two weeks after a Florida school shooting left 17 students and faculty dead, put the country on edge and ignited a new debate over gun control in America. The shooting happened about 11:30 a.m. Wednesday during Davidson’s planning period. Students were trying to get into his classroom, but he wouldn’t let them in. The students notified the principal, who tried to open it with a key. 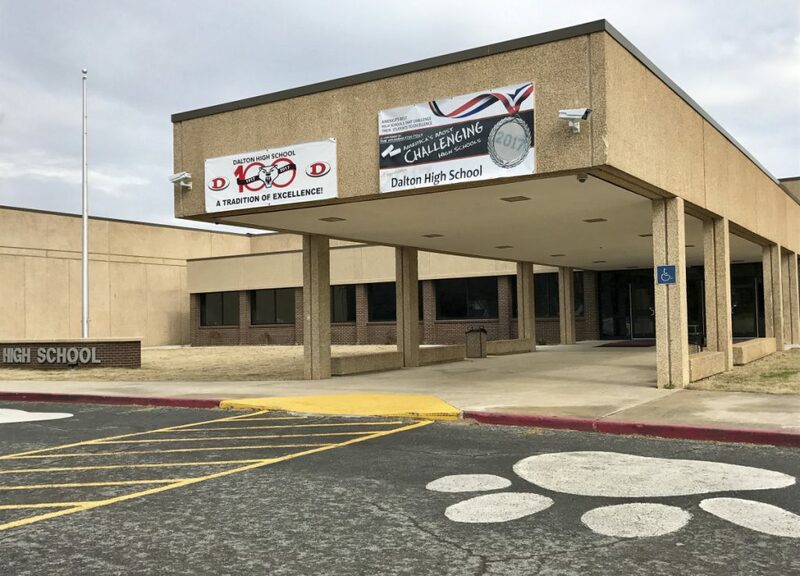 At Dalton High a week ago, police found a “threatening” note on the floor of a classroom, but it wasn’t related to the shooting Wednesday. Police said the note was found Feb. 21, and mentioned a threat against the school the following day. Assistant Police Chief Cliff Cason said in a statement at the time that officers planned an increased presence at the city’s schools in response after the note was found. Threats have been made at schools across the country in the wake of the Feb. 14 shooting at Marjory Stoneman Douglas High School in Parkland, Florida. Dalton has about 2,000 students, according to its website. It is located about 90 miles north of Atlanta. Students were taken to the Northwest Georgia Center and parents advised to go there to pick them up. Dalton is known as the Carpet Capital of the World, since much of the carpet for U.S. and world markets is produced within a 25-mile radius of the city. The origins of Dalton’s carpet industry are traced to the making of bedspreads in the community. Associated Press writers Jacob Jordan in Atlanta and Alina Hartounian in Phoenix contributed to this report.